As we hurtle toward the end of the year – always a scary thing because you realise how much you didn’t get done in the year that’s passed – it’s time to look back at just a little of what happened in 2018. This article is not anything like a TetZoo review of 2018 (I’ll aim to produce something along those lines in early 2019), but, rather, a quick look at some of the year’s neatest and most exciting zoological (well, tetrapodological) discoveries. As per usual, I intended to write a whole lot more – there are so many things worthy of coverage – and what we have here is very much an abridged version of what I planned. Animals we will meet below, a montage. Images: (c) Philippe Verbelen, (c) Kristen Grace, Florida Museum of Natural History, Graham et al. (2018), CC BY-SA 4.0. The Rote leaf warbler. New passerine bird species are still discovered on a fairly regular basis; in fact three were named in 2018*. One of these is especially remarkable. It’s a leaf warbler, or phylloscopid, endemic to Rote in the Lesser Sundas, and like most members of the group is a canopy-dwelling, insectivorous, greenish bird that gleans for prey among foliage. Leaf warblers are generally samey in profile and bill shape, so the big deal about the new Rote species – the Rote leaf warbler Phylloscopus rotiensis – is that its bill is proportionally long and curved, giving it a unique look within the group. It superficially recalls a tailorbird. Indeed, I think it’s likely that the species would be considered ‘distinct enough’ for its own genus if there weren’t compelling molecular data that nests it deeply within Phylloscopus (Ng et al. 2018). * The others are the Cordillera Azul antbird Myrmoderus eowilsoni and the Western square-tailed drongo Dicrurus occidentalis. 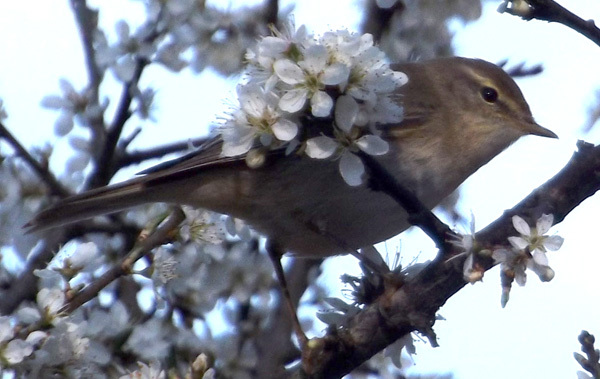 A Common chiffchaff Phylloscopus collybita encountered in western Europe, a familiar Eurasian-African phylloscopid leaf warbler. Image: Darren Naish. The story of the Rote leaf warbler’s discovery is interesting in that it’s yet another recently discovered species whose existence and novelty was suspected for a while. Colin Trainor reported leaf warblers on Rote in 2004 but never got a good look at them, Philippe Verbelen observed them in 2009 and realised how anatomically unusual they were, and it wasn’t until 2015 that a holotype specimen was procured (Ng et al. 2018). I’ve mentioned before the fact that documenting and eventually publishing a new species is rarely an instant see it catch it publish it event, but a drawn-out one that can take decades, and here we are again. Also worth noting is that the existence of a leaf warbler on Rote was not predicted based on our prior knowledge of leaf warbler distribution in view of the deep marine channel separating Rote from Timor and lack of any prior terrestrial connection. Yeah, birds can fly, but members of many groups prefer not to cross deep water channels. In this case, this did, however, happen and most likely at some point late in the Pliocene (Ng et al. 2018). Rote leaf warbler in life, a novel member of an otherwise conservative group. Image: (c) Philippe Verbelen. Rote has yielded other new passerines in recent years – the Rote myzomela Myzomela irianawidodoae (a honeyeater) was named in 2017 – and it’s possible that one or two others might still await discovery there. Neanderthal cave art. Hominins don’t get covered much at TetZoo, which is weird given the amazing pace of relevant recent discoveries and the fact that they’re totally part of the remit. I mostly don’t cover them because I feel they’re sufficiently written about elsewhere in the science blogging universe, plus I tend to be preoccupied with other things. Nevertheless, I take notice, and of the many very interesting things published in 2018 was Hoffman et al.’s (2018) announcement of several different pieces of Spanish rock art, seemingly made by Neanderthals Homo neanderthalensis. The art concerned involves hand stencils, abstract lines, squares and amorphous patches of pigment, always marked in red. Red abstract markings, discovered in several Spanish caves, are old, and in fact were seemingly made by hominins long before H. sapiens moved into Europe. The red sinuous marking and system of squares and lines near the middle of this photo are purported to have been made by Neanderthals (other images, depicting animals and present adjacent to these markings, were seemingly created more recently by H. sapiens individuals). Image: (c) P. Saura. The main reason for the attribution of this art to Neanderthals is its age: uranium-thorium dating shows that it’s older than 64ka, which therefore makes it more than 20ka older than the time at which H. sapiens arrived in Europe (Hoffman et al. 2018). That seems compelling, and it’s consistent with a building quantity of evidence for Neanderthal cultural complexity which involves the use of shells, pigments, broken stalagmites and so on. One of the most famous pieces of claimed Neanderthal rock art: the Gorham's Cave ‘hashtag’ from Gibraltar. Image: (c) Stewart Finlayson. I should add here, however, that I’m slightly sceptical of the use of age as a guide to species-level identification. Why? Well, we have evidence from elsewhere in the fossil record that the range of a hominin species can be extended by around 100ka without serious issue (witness the 2017 announcement of H. sapiens remains from north Africa; a discovery which substantially increased the longevity of our species). In view of this, would a 20ka extension of H. sapiens’ presence in Europe be absolutely out of the question? Such a possibility is not supported by evidence yet, and I don’t mean to appear at all biased against Neanderthals. A tiny Cretaceous anguimorph in amber, and other Mesozoic amber animals. As you’ll know if you follow fossil-themed news, recent years have seen the discovery of an impressive number of vertebrate fossils in Cretaceous amber, virtually all of which are from Myanmar and date to around 99 million years old. They include tiny enantiornithine birds, various feathers (most recently racquet-like ‘rachis dominated feathers’), the tiny snake Xiaophis, early members of the gecko and chameleon lineages and the small frog Electrorana. Many of these finds were published in 2018 and any one could count as an ‘amazing’ discovery. The Barlochersaurus winhtini holotype, from Daza et al. (2018). However, there’s one fossil in particular that I find ‘amazing’, and it hasn’t received all that much coverage. It’s the tiny (SVL* 19.1 mm! ), slim-bodied anguimorph Barlochersaurus winhtini, named for a single, near-complete specimen subjected to CT-scanning (Daza et al. 2018). Remarkable images of its anatomical details are included in Daza et al.’s (2018) paper. It has short limbs, pentadactyl hands and feet and a slim, shallow, bullet-shaped skull. Phylogenetic study finds it to be somewhere close to, or within, Platynota (the clade that includes gila monsters and kin, and monitors and kin), or perhaps a shinisaurian (Daza et al. 2018). It could be a specialised dwarf form, or somehow more reflective of the ancestral bauplan for these anguimorph groups. Either way, it’s exciting and interesting. What next from Burmese amber? Barlochersaurus in life. It’s about the size of a paperclip. Image: (c) Kristen Grace, Florida Museum of Natural History (original here). The Reticulated Siren. Sirens are very special, long-bodied aquatic salamanders with reduced limbs and bushy external gills. They’re very weird. They can reach 95 cm in length (and some fossil species were even larger), lack hindlimbs and a pelvis, have a horny beak and pavements of crushing teeth, and eat plants in addition to gastropods, bivalves and other animal prey. A longish article on siren biology and evolution can be found here at TetZoo ver 3. A life reconstruction of the Cretaceous siren Habrosaurus, showing features typical of the group. This animal could reach 1.5 m in total length. Image: Darren Naish (prepared for my in-prep texbook The Vertebrate Fossil Record, on which go here). Until recently, just four living siren species were recognised. But it turns out that indications of a fifth – endemic to southern Alabama and the Florida panhandle – have been around since 1970 at least. Furthermore, they pertain to a big species, similar in size to the Great siren Siren lacertina. Known locally as the ‘leopard eel’ (a less than ideal moniker, given that there’s a real eel that already goes by this name), this animal has been published by Sean Graham and colleagues in the open-access journal PLoS ONE (Graham et al. 2018) wherein it’s formally christened the Reticulated siren S. reticulata. It reaches 60 cm in total length, has dark spots across its dorsal surface and a proportionally smaller head and longer tail than other Siren species. A museum specimen of the species has been known since 1970 when its finder noted that it did “not conform” to descriptions of known species, and live specimens were collected by David Steen and colleagues in 2009 and 2014. Again, note that discovery and recognition was a drawn-out process. The discovery has, quite rightly, received a substantial amount of media coverage, and many interesting articles about the find are already online. Many of you will already know of David Steen due to his social media presence and Alongside Wild charity (which I’m proud to say I support via pledges at patreon). The Reticulated siren paratype specimen, as described by Graham et al. (2018). Image: Graham et al. (2018), CC BY-SA 4.0. Original here. The idea that a new living amphibian species 60 cm long might be discovered anew in North America in 2018 is pretty radical. I’m reminded of the 2009 TetZoo ver 2 article ‘The USA is still yielding lots of new extant tetrapod species’ (which is less fun to look at than it should be, since images aren’t currently showing at ver 2). Furthermore, Graham et al. (2018) discovered during their molecular phylogenetic work that some other siren species are not monophyletic but likely species complexes, in which case taxonomic revision is required and more new species will probably be named down the line. And that’s where I must end things, even though there are easily another ten discoveries I’d like to write about. This is very likely the last article I’ll have time to deal with before Christmas. As I write, I’m preparing to leave for the Popularising Palaeontology conference which happens in London this week (more info here), and then there are Christmas parties and a ton of consultancy jobs to get done before the New Year. On that note, I’ll sign off with a festive message, as is tradition. Best wishes for the season, and here’s to a fruitful and action-packed 2019. Special thanks once again to those helping me out at patreon. Daza, J. D., Bauer, A. M., Stanley, E. L., Bolet, A., Dickson, B. & Losos, J. B. 2018. An enigmatic miniaturized and attenuate whole lizard from the mid-Cretaceous amber of Myanmar. Breviora 563, 1-18. Graham, S. P., Kline, R., Steen, D. A. & Kelehear, C. 2018. Description of an extant salamander from the Gulf Coastal Plain of North America: the Reticulated Siren, Siren reticulata. PLoS ONE 13 (12): e0207460. Hoffman, D. L., Standish, C. D., García-Diez, M., Pettitt, P. B., Milton, J. A., Zilhão, J., Alcolea-González, J. J., Cantelejo-Duarte, P., Collado, H., de Balbín, R., Lorblanchet, M., Ramos-Muñoz, J., Weniger, G.-Ch. & Pike, A. W. G. 2018. U-Th dating of carbonate crusts reveals Neandertal origin of Iberian cave art. Science 359, 912-915. Ng, N. S. R., Prawiradilaga, D. M., Ng, E. Y. X., Suparno, Ashari, H., Trainor, C., Verbelen, P. & Rheindt, F. E. 2018. A striking new species of leaf warbler from the Lesser Sundas as uncovered through morphology and genomics. Scientific Reports 8: 15646. Posted in birds, herpetology, squamates and tagged with birds, ornithology, amphibians, squamates, herpetology, primates, hominins. December 16, 2018 by Darren Naish. Among my favourite lizards are the Uromastyx agamids, variously termed mastigures, dabbs, dabs, dhubs, spinytails, spiny-tailed agamas, spiny-tailed lizards or thorny-tailed lizards. In the pet trade they’re often called ‘uros’. Here, I’ll be calling them mastigures. A large mastigure is a fine, handsome, happy-looking lizard. The dark overall colour and yellow dorsal occellations show that this captive specimen is a Moroccan mastigure Uromastyx acanthinurus. Image: Darren Naish. Mid-sized for lizards (25 cm in total length is typical, though read on), they’re rather chunky, short-headed and wide-bodied with a proportionally short, broad tail that’s covered in 10 to 30 transverse, parallel rows of posterodistally projecting spines. The rows have a ring-like form and (rather confusingly) are typically called whorls. The tail is said to function as a ‘burrow blocker’ and also to be lashed from side to side when deterring would-be attackers. 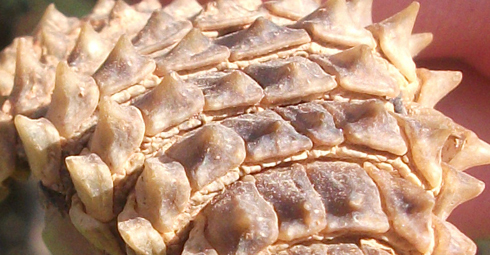 Enlarged, thorn-like scales are also present on the hindlimbs of some species. The head is short and deep by lizard standards and a neat feature is that the labial scales are large, serrated structures that sometimes look like external pseudoteeth. Head detail of a captive U. acanthinurus. Note the pseudoteeth-like upper labial scales. The white exudate around the nostrils is pretty typical: it's salt discharge and evidence of nasal salt excretion typical for desert-dwelling lizards. Image: Darren Naish. Mastigures are extremely variable in colour, ranging from almost black to almost white dorsally; areas of yellow and even bright orange are present in some species, sometimes forming eye-like markings, distinct spots large or small, or transverse bands. The head may be much darker than the rest of the animal, and sometimes the tail is different in colouration too. Adding to this complexity is that individuals change colour according to temperature and time of day. The tail is variable in size: it's similar in length to the body in most species but is very short and broad in a few species, most notably the Omani spiny-tailed lizard or Thomas's mastigure U. thomasi. A captive U. thomasi. The complex colouration - the facial banding in particular - is notable, as is the very short, broad, plump tail. This is a small mastigure with a total length of less than 15 cm. Recent surveys indicate that it is now extinct on mainland Oman - its type location - and is now unique to Masirah Island where local extinction has also occurred due to habitat destruction. There are anecdotal 2012 references to its persistence on the mainland, however. Image: Darren Naish. The teeth are especially interesting: they’re short, low-crowned and fused to the jaw bones on their lingual (tongue) side, are largest at the back of the jaws, have crescentic shearing tips, and possess oblique wear facets that become so pronounced with age that entire teeth can be worn right down to the jaw (Cooper & Poole 1973). As you might guess, these animals do not possess regular tooth replacement of the sort we associate with reptiles (Robinson 1976). This is linked with a style of jaw movement (termed propaliny) where the lower jaw slides forwards to create a shearing bite when the jaws are closed (Throckmorton 1976). In the premaxillae, the upper central incisiforms are replaced by projecting structures that have been interpreted as bony pseudoteeth (Anderson 1999), though I don’t know if the histological work required to demonstrate this has been performed and they might be fused teeth. The skull of U. aegyptia, as scanned for The Deep Scaly Project and available here. Note that the partially fused teeth are largest posteriorly. The mandible is deep, the front of the dentary is toothless and bony pseudoteeth are present in the premaxilla. Image: Digimorph. Mastigures occur throughout the steppes, deserts and semi-deserts of northern Africa, the Middle East and western and central Asia. They aren’t associated with dune-fields, instead inhabiting rocky or gravel-covered regions or areas with compacted sand. They use and build burrows that are sometimes 3 m long or so, though I would expect based on data from other burrow-digging reptiles that burrows at least twice as long might exist. ‘Colonial burrows’ have been mentioned in the literature (Anderson 1999), though I don’t know if this means that many burrows were located in close proximity or if the burrows were known to contain some or many lizards. An Iraqi, Mesopotamian or Small-scaled spiny-tailed lizard Saara loricata (formerly U. loricatus), a mid-sized species of Iran and Iraq, as illustrated in one of Boulenger's 1885 catalogues of amphibians and reptiles kept in the collections of the British Museum. Image: Boulenger 1885. Around 15 extant species are recognised with Uromastyx, five of which have been named since 1990: U. maliensis Joger & Lambert, 1996, U. occidentalis Mateo et al., 1999 (or 1998), U. leptieni Wilms & Böhme, 2001 (or 2000…), U. alfredschmidti Wilms & Böhme, 2001 (or 2000…) and U. yemenensis Wilms & Schmitz, 2007. The total number of recognised species is a bit vague since some taxa are regarded as subspecies by some authors and as distinct species by others. An additional three Asian species have recently been removed from Uromastyx and placed in the resurrected genus Saara, first named by Gray in 1845 (Wilms et al. 2009). Saara species possess so-called intercalary scales between the spine whorls on the tail and molecular data finds them to be the sister-group to Uromastyx (Tamar et al. 2018). Persian or Iranian spiny-tailed lizard Saara asmussi, as illustrated in William Blanford's paper of 1876. This species occurs in Iran, southern Afghanistan and Pakistan. The Saara species were included within Uromastyx prior to Wilms et al. (2009). Image: Blanford 1876. In recent years, Uromastyx mastigures have become increasingly common in the pet trade and it’s now normal to see them on show in places that sell pet reptiles. I have seen them in the wild while on fieldwork in the Sahara, but the individuals concerned were dead and I never have seen a live one in the wild. A sadly deceased baby mastigure (probably U. acanthinurus), discovered in the Moroccan Sahara. Cause of death unknown. Note that the tail is fully developed and sports the full complement of tail spines, despite the animal's small size. Image: Darren Naish. Biology and behaviour. Mastigures are omnivorous, but they’re (seemingly) essentially herbivorous as adults, only occasionally eating arthropods or smaller lizards. The presence of symbiotic gut flora has been demonstrated for some species (a feature seen elsewhere in agamids in the Hydrosaurus sailfin dragons). Their lifestyle requires their taking refuge in rock crevices or burrows when they’re not feeding, foraging, basking or interacting socially, a behavioural syndrome where a compressed body shape and defensive spiny tail are advantageous, and one that has evolved convergently in other iguanians – the American chuckwallas and ctenosaurs and Madagascan oplurines – and in the Australian Egernia skinks and in some African corylids (Pianka & Vitt 2003). The tail of a deceased mastigure (probably U. acanthinurus), discovered in the Moroccan Sahara. Image: Darren Naish. Herbivory in lizards works best at large size for the obvious reason of how much nutrition can be recovered (though it’s worth saying that there are many exceptions to this tendency: see Espinoza et al. 2004); it follows, then, that mastigures are relatively large compared to other agamids. I don’t know if there are any studies that do demonstrate this specifically, but the fact that most species are 25-45 cm long as adults does seem large, and the biggest species – the Egyptian or Leptien’s mastigure U. aegyptia – is positively enormous, reaching 75 cm on occasion and even more (specimens nearly 1 m long have been reported… can you imagine a mastigure this size? Amazing). It’s worth saying here that an especially large Paleogene lizard – Barbaturex from the middle Eocene of Myanmar, it perhaps reached 2 m in total – appears to be an especially close relative of Uromastyx (Head et al. 2013). I was curious to know what a c 90 cm mastigure would look like compared to a person. The smaller of these silhouettes reveals the answer. Not as impressive as I was hoping. 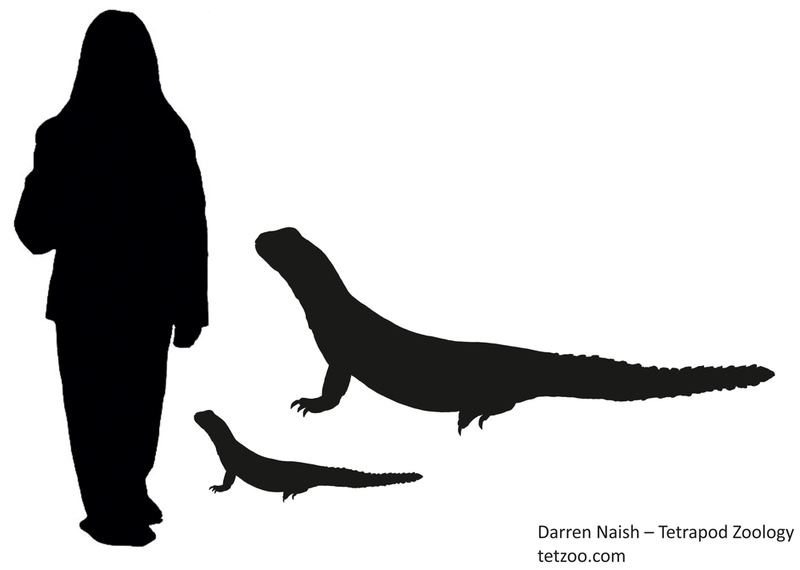 The larger lizard silhouette depicts the approximate size of the Eocene taxon Barbaturex, though we don't know that it had spiny whorls on its tail as shown in the illustration. The human figure is 1.7 m tall. Image: Darren Naish. Mastigures are oviparous, females laying clutches of 6-20 elliptical eggs within a burrow. The hatchlings stay within the burrow for a few weeks, possibly even for months. The mother remains in attendance across this time and her burrow-guarding behaviour might be a form of parental care (directed both at the eggs and the hatchlings). Given that these lizards possess a symbiotic gut flora, the babies are presumably coprophagous. I’ve seen this stated informally but am not aware of a study that demonstrates it. Remember that tetrapods that possess a symbiotic gut flora must obtain it from their parents, and thus must eat their parent's dung early in life. Mm-mm. An Egyptian spiny-tailed lizard U. aegyptia, as depicted in John Anderson's 1898 volume on the amphibians and reptiles of Egypt. Image: Anderson 1898. Antiquity, taxonomy, biogeography. Having mentioned fossils, jaw fragments that appear to be from Uromastyx-like agamids (though not necessarily Uromastyx itself) are known from the Lower Eocene of Kyrgyzstan (Averianov & Danilov 1996) and hence establish an age of around 50 million years for this lineage. A number of Paleocene and Eocene lizards from Mongolia and China appear to be additional uromastycines. Rather younger, Oligocene fossils from the famous Jebel Qatrani Formation of the Fayum in Egypt’s Western Desert are sufficiently mastigure-like that they’ve been identified as ‘cf. Uromastyx’ (‘cf’ is an abbreviation of the Latin ‘confer’ and, when used in a taxonomic identification, basically means ‘we think that these fossils are so comparable to [insert taxon of interest] that they might belong to it, though we can’t be sure’). They date to the Lower Oligocene and hence are around 33 million years old (Holmes et al. 2010). There’s also a Lower Oligocene Uromastyx mastigure from France – yes, a European member of the group. Just one of the many uromastycine fossil jaw fragments from the Lower Eocene of Kyrgyzstan descibed by Averianov & Danilov (1996). These fossils - and others - demonstrate the antiquity of this group within Eurasia and show that it didn't arrive in the region after its Miocene collision with Africa. The scales bars = 1 mm. Image: Averianov & Danilov (1996). This antiquity is in keeping with the idea – made on the basis of their highly distinctive anatomy – that mastigures are ‘distinct enough’ from other agamids to be worthy of their own ‘subfamily’: Uromastycinae. This view derives support from those studies that have found or inferred mastigures to be a distinct lineage outside the clade containing all remaining crown-agamids (e.g., Frost & Etheridge 1989, Macey et al. 2000, Schulte et al. 2003, Pyron et al. 2013), and perhaps even outside the clade that includes chameleons and conventional agamids (Honda et al. 2000, Gauthier et al. 2012). That last result would push mastigure origins into the Cretaceous given amber fossils that seem to be stem-chameleons. A phylogeny for agamids and their close kin, as recovered by Honda et al. (2000). Mastigures and butterfly agamas form a clade, and both are outside the clade that includes chameleons and 'Agamidae' of tradition. Like all of these sorts of diagrams, this was produced for my in-prep Vertebrate Fossil Record book, progress on which can be seen here. Image: Darren Naish. Oh, you want Cretaceous stem-mastigures? In 2016, Apesteguía et al. (2016) described Jeddaherdan aleadonta from the Cenomanian of Morocco, and concluded that both this taxon and Gueragama sulamericana from the Upper Cretaceous of Brazil – both represented by partial lower jaws – are exactly that. Fossil evidence does, therefore, now back up the idea that these lizards were in existence before the end of the Cretaceous, and that acrodonts* (and thus iguanians more generally) had evolved at least some of their variation before the Cenozoic. * Acrodonts (properly Acrodonta): the iguanian lizard clade that includes chameleons and agamids. They are named for their acrodont teeth: that is, those fused to the jawbones (though this condition is not fully developed across all members of the clade, and note that there are acrodont reptiles that are not part of Acrodonta). The Cretaceous uromastycine Jeddaherdan aleadonta is known from the chunk of lower jaw shown here, depicted within a silhouetted skull of Uromastyx. The scale bar is in mm. Image: Apesteguía et al. (2016). At least some studies find mastigures to form a clade with the east Asian butterfly agamas Leiolepis (e.g., Honda et al. 2000, Hugall & Lee 2004, Gauthier et al. 2012), both then being united within Leiolepidinae*. Butterfly agamas are fascinating for all sorts of reasons and I really should write about them at some point as well. * There’s a long and complex argument over whether Leiolepidinae/Leiolepididae or Uromastycinae/Uromastycidae should win in a priority battle. Modern authors have tended to prefer the former, since it’s 1843 as opposed to 1863 for Theobald’s Uromastycidae. Anderson (1999) argued that the 1843 use of Fitzinger’s name cannot win this battle, since it was originally ‘Leiolepides’ and was not written in its ‘modern’ form by authors pre-1900. Mastigures and butterfly agamas have not been found to form a clade in all phylogenetic studies: in Pyron et al. 's (2013) study - this cladogram depicts the topology they recovered - the two are successively closer to remaining Agamidae. Note the taxonomic names they used for the agamid lineages. Like all of these sorts of diagrams, this was produced for my in-prep Vertebrate Fossil Record book, progress on which can be seen here. Image: Darren Naish. Anyway: here I’ll say what I usually do and remind you that if these animals were mammals or birds they’d almost definitely be considered ‘distinct enough’ to warrant their own ‘family’, a decision that would require Agamidae of tradition to be split into several ‘families’ (I put these taxonomic ranks in quotes because they’re still effectively subjective). In addition to a mastigure family and butterfly agama family, there would be one for Hydrosaurus, one for the Australasian dragons (or amphibolurines), another for the Asian draconines, and so on. A few authors – most notably Scott Moody in his studies of the early 1980s – have at least separated mastigures and butterfly agamas from remaining agamids in a version of Theobald's ‘family’ Uromastycidae. Butterfly agamas (Leiolepis) do look mastigure-like in some features of the face (those tall ridges over the orbits especially), but are otherwise far slimmer, longer-limbed and without their other specialisations. The two groups may be closely related - though it still seems that they diverged during the Late Cretaceous, at least. Image: TheReptilarium, CC BY 2.0. Macey et al. (2000) assumed an Indian origin for mastigures, in which case they’re among several tetrapod groups that followed an ‘Out of India’ dispersal route hypothesised elsewhere for ostriches and certain caecilians and frogs. But this is also contradicted by fossils, since Paleocene members of the lineage – if correctly identified and correctly dated – show that members of the lineage were living in Eurasia before India docked with Eurasia during the Eocene. The best model, therefore, might be one in which mastigures moved into Eurasia at the end of the Cretaceous. An Eocene map depicting the planet as of around 40 million years ago. At this point, Afro-Arabia had not docked with Eurasia. But members of the mastigure lineage were already present in Eurasia and Afro-Arabia by the time. Image: the original version was used in Angst et al. (2013); this has been modified as per CC BY 2.5. Tamar et al. (2018) posited an initial, middle Miocene diversification of the Uromastyx crown-group in south-east Asia followed by Afro-Arabian invasion and diversification. But note that this only applies to crown-group Uromastyx, not to the Saara + Uromastyx clade, nor to the mastigure lineage as a whole, and thus is not inconsistent with an earlier origin and diversification elsewhere. Tamar et al. (2018) found Uromastyx to consist of two main clades, one mostly associated with the Arabian Peninsula and the borders of the Red Sea, one with the western Sahara. 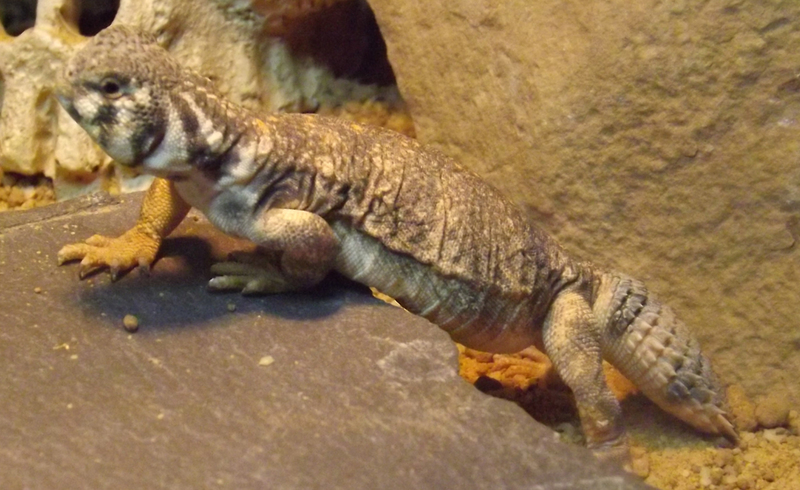 Saara forms the sister-group to Uromastyx. Image: Tamar et al. (2018). Your regular dose of misanthropy. Finally, all is not well as goes the future of mastigures. As you might guess given my earlier mentions of the pet trade, the sad fact is that uncontrolled, indiscriminate and often illegal collection from the wild is a threat to many populations. Many people involved in the pet reptile trade – those at the sharp end where animals are taken from the wild and smuggled to other countries – have no scruples whatsoever as goes the ethical or managed treatment of animals, and if you don’t believe me look up articles on Anson Wong, the Malaysian wildlife smuggler known as the ‘Lizard King’ (a most inappropriate moniker, given that Kings are supposed to be worthy of respect or admiration). I would love to see a large, spectacular mastigure in the wild. This mastigure (U. aegyptia microlepis), photographed in Al Anbar, Iraq, is a grand, magnificent animal. Image: U.S. Federal Government, Public Domain. Mastigures have also been much used for food, medicine and as ritual objects (a cleaned mastigure body serves as a traditional baby’s bottle in Morocco, for example), all of which is fine (in theory) when harvesting is kept to sustainable levels… but less fine when exploitation begins to outstrip supply. Those mastigures that have been studied are declining or locally extinct across their range and all species are CITES listed as of 1977. Specifically, they’re on Appendix II of CITES, which refers to species that are not necessarily in immediate danger of extinction but do nonetheless require a control in their trade. The large size and interesting appearance of many mastigure species - this is a captive U. aegyptia - has long made them appealing objects of trade and medicinal use, and as objects for the table too. Image: Darren Naish. In some countries where these lizards occur it’s considered a rite of passage for young men to go out and kill as many mastigures as they can, and if you want verification for that you can find photos online where there are great piles of tens or even hundreds of dead mastigures in the backs of trucks. That’s depressing and vile behaviour. Like Anne Frank, I do think that people are essentially good but it’s difficult to maintain a rosy view of humanity when our stated aim seems to be the denuding of wild spaces of their animals. On that depressing note, we move on. This article took a lot of work and quickly expanded way beyond the brief ‘here’s a picture of a lizard’ article it was originally intended to be. However, I think that articles like this are useful and would like to keep doing them. Here’s your regular reminder that I require support if this is to continue. I would do more if support allowed. Thanks to those who support me at patreon already. Anderson, S. C. 1999. The Lizards of Iran. Society for the Study of Amphibians and Reptiles, Saint Louis. Apesteguía, S., Daza, J. D., Simões, T. R. & Rage, J. C. 2016 The first iguanian lizard from the Mesozoic of Africa. Royal Society Open Science 3: 160462. Averianov, A. & Danilov, I. 1996. Agamid lizards (Reptilia, Sauria, Agamidae) from the Early Eocene of Kyrgyzstan. Neues Jahrbuch fur Geologie und Paläontologie, Monatshefte 1996 (12), 739-750.
Cooper, J. S. & Poole, F. G. 1973. The dentition and dental tissues of the agamid lizard Uromastyx. Journal of Zoology 169, 85-100. Espinoza, R. E., Wiens, J. J. & Tracy, C. R. 2004. Recurrent evolution of herbivory in small, cold-climate lizards: breaking the ecophysiological rules of reptilian herbivory. Proceedings of the National Academy of Sciences 101, 16819-16824. Frost, D. R. & Etheridge, R. 1989. A phylogenetic analysis and taxonomy of iguanian lizards (Reptilia: Squamata). University of Kansas, Museum of Natural History, Miscellaneous Publication 81, 1-65. Gauthier, J. A., Kearney, M., Maisano, J. A., Rieppel, O. & Behlke, D. B. 2012. Assembling the squamate tree of life: perspectives from the phenotype and the fossil record. Bulletin of the Peabody Museum of Natural History 53, 3-308. Holmes, R. B., Murray, A. M., Chatrath, P., Attia, Y. S. & Simons, E. L. 2010. Agamid lizards (Agamidae: Uromastycinae) from the Lower Oligocene of Egypt. Historical Biology 22, 215-223. Honda, M., Ota, H., Kobayashi, M., Nabhitanhata, J., Yong, H.-S., Sengoku, S. & Hikida, T. 2000. Phylogenetic relationships of the family Agamidae (Reptilia: Iguania) inferred from mitochondrial DNA sequences. Zoological Science 17, 527-537. Hugall, A. F. & Lee, M. S. Y. 2004. Molecular claims of Gondwanan age for Australian agamid lizards are untenable. Molecular Biology and Evolution 21, 2102-2110. Macey, J. R., Schulte, J. A., Larson, A., Ananjeva, N. B., Wang, Y., Pethiyagoda, R., Rastegar-Pouyani, N. & Papenfuss, T. J. 2000. Evaluating trans-Tethys migration: an example using acrodont lizard phylogenetics. Systematic Biology 49, 233-256. Pianka, E. R. & Vitt, L. J. 2003. Lizards: Windows the Evolution of Diversity. University of California Press, Berkeley. Robinson, P. L. 1976. How Sphenodon and Uromastyx grow their teeth and use them. In Bellairs, A. d’A. & Cox, C. B. (eds) Morphology and Biology of Reptiles. Academic Press (London), pp. 43-64. Schulte, J.A., Valladares, J. P. & Larson, A. 2003. Phylogenetic relationships within Iguanidae inferred using molecular and morphological data and a phylogenetic taxonomy of iguanian lizards. Herpetology 59, 399-419. Tamar, K., Metallinou, M., Wilms, T., Schmitz, A., Crochet, P.-A., Geniez, P. & Carranza, S. 2018. Evolutionary history of spiny-tailed lizards (Agamidae: Uromastyx) from the Saharo-Arabian region. Zoologica Scripta 47, 159-173. Throckmorton, G. S. 1976. Oral food processing in two herbivorous lizards, Iguana iguana (Iguanidae) and Uromastix [sic] aegyptius [sic] (Agamidae). Journal of Morphology 148, 363-390. Wilms, T. Böhme, W., Wagner, P., Lutzmann, N. & Schmitz, A. 2009. On the phylogeny and taxonomy of the genus Uromastyx Merrem, 1820 (Reptilia: Squamata: Agamidae: Uromastycinae) – resurrection of the genus Saara Gray, 1845. Bonner Zoologische Beiträge 56, 55-99. Posted in squamates, herpetology and tagged with herpetology, squamates, reptiles. August 28, 2018 by Darren Naish.